There were a good number of NES franchises that ended up making appearances on the Game Boy system, some better than others. 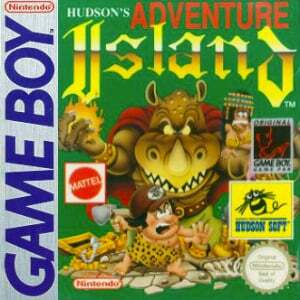 Hudson had already enjoyed some popularity on the NES console with their Adventure Island titles, so it was pretty much a no-brainer that they'd eventually bring the series to Nintendo's portable system. For some reason they decided to skip over the first NES Adventure Island release and focus their attention on its sequel, Adventure Island II. Adventure Island on Game Boy, and now the 3DS Virtual Console, isn't a carbon copy of the NES release but is obviously very heavily influenced by it, and thankfully most of its good qualities survived the trip over to the portable arena pretty much unscathed. 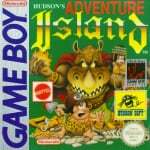 The Adventure Island releases have always focused the majority of their attention on the platforming aspects of the game, and this title is certainly no exception. You control Master Higgins using the d-pad and can make him run as well as toss his axes by using the "B" button. Of course, what would a platformer be without the ability to jump with a tap of the "A" button? As you run and toss your weapon, you'll notice that your health gauge will diminish at a faster rate; this forces you not only to hurry along, but also to use your axes sparingly if you're to have any hope of making it to the end of the level. There are fruits available at random points throughout each level that you can pick up to partially restore your health gauge, but not so many that you can afford to be too frivolous with your time or weapons usage. The adventure takes place on 6 different islands, each containing 5 levels for you to play through. 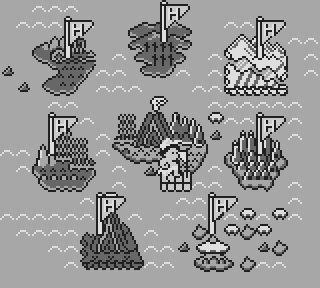 The last level of each island will be followed up by a boss fight, and unlike many other platformers, if you are defeated by the boss you must play through the entire last level of the island all over. As you might imagine, this provides you with a great deal of incentive to get the job done the first time through. 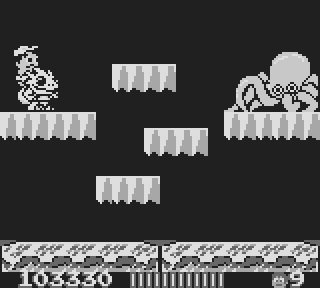 Once you've defeated the boss, you'll then move on to the next island, with your ultimate goal being to defeat the boss on each island and regain control over it in order to face the final foe at the end of the game. Of course, that's assuming you can make it that far, though the ability to create a restore point and suspend state save on the 3DS does make this challenge more accessible. The control itself is about what we've come to expect from the Adventure Island releases. It's a bit loose and will require you to be fairly precise on many of the pinpoint platforming sections you'll ultimately face throughout the game, but it's also about memorizing the layouts and enemy patterns as well. The ability to locate hidden monster eggs also gives the game a nice gameplay twist, as breaking open one of these hidden eggs will allow you to take control of various types of dinosaurs. Some of these dinosaurs offer up powerful firepower, whereas others allow you to swim through the water or fly through the air with greater ease and precision. It's this careful blend of platforming and action elements that make the game so enjoyable to play and will likely keep you coming back for more in your quest to finally finish all of the game's many levels. 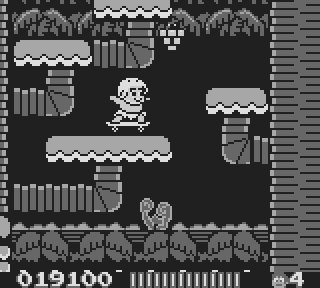 The visuals in Adventure Island are actually fairly impressive considering they're running under the original Game Boy hardware specifications. There's quite a bit of detail in the various surroundings and even the character and enemy sprites are quite large and well defined. There are a few hints of slowdown when things get too hectic on-screen, but they're few and far between and generally come at a time when you need things to slow down a bit anyway in order to make it through one of the many tricky spots in the game. Musically, Hudson was able to do a very nice job of porting over the musical score from the NES release to the portable Game Boy system, with little lost during the transition. In fact, a few of the tracks are actually better than those found in the original NES release, as are some of the sound effects. It might have taken developers a bit longer to come to grips with the sound capabilities of the Game Boy system, but this early effort from Hudson stands as one of the better Game Boy releases during the early part of its lifespan. The same complaint that could be levelled against the early NES Adventure Island releases can also be said of this Game Boy iteration: the control system can, at times, seem a tad on the slippery side. In reality, this is really what gives the Adventure Island games their unique feel and Hudson was able to capture that feeling quite well for their first portable release in the series. While not quite as musically or graphically flashy as the NES release, there are still a lot of great level designs and a surprisingly lengthy quest to take on, even for more seasoned platformer fans looking for a challenge. 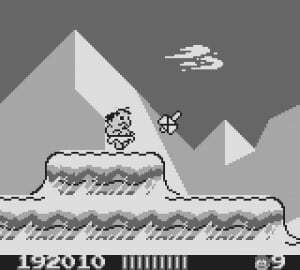 Adventure Island might not be quite as polished or playable as its sequel on the Game Boy system, but it's still a worthy retro platforming experience on the 3DS, for those who can appreciate what this unique series has to offer. got it yesterday its a good platformer.fairly easy so far beat 1st boss.but at least you can play the game to the end without pulling your hair out.i played wonderboy games on sega consoles.they are identical really. I really love this game, still have the original cartridge. I think it should be an 8 or something. So, the NES version of this game, Adventure Island II still hasn't come out in the US? At this point I'm doubtful that it ever will so I think that I will download this game instead. I enjoyed New Adventure Island on the VC so I'm sure that I will enjoy this one as well. Got it today on a whim and already loving it... I remember the original when it came out on both systems but the box art really turned me off. Thankfully the game is much better than the hokey childish looking box art lol A little on the easy side, but i love it just the same! I've never played an Adventure Island game. Might pick this one up after I finish Metroid II and Kirby 3D Classic.